In a new study, 100% of people suffering from acute high blood pressure saw it go down significantly within hours of drinking a cup of beetroot juice. Importantly, blood pressure remained lower up to 24 hours later. The research, funded by the British Heart Foundation, was lead by Professor Amrita Ahluwalia, Professor of Vascular Biology at the William Harvey Research Institute (Barts Hospital, London) and has been published in Hypertension, the Journal of the American Heart Association. A sample of 8 women and 7 men with systolic blood pressures varying from 140 to 159 mm Hg were given 250ml of Beet It organic beetroot juice in a double blind crossover trial using a placebo (a depleted nitrate beetroot juice made especially for the project). An average reduction of 10 mm Hg was recorded in those drinking the nitrate rich juice, with both systolic and diastolic blood pressures being lowered. The effect was most pronounced 3 to 6 hours after drinking the juice. The results will be particularly welcomed by people with high blood pressure who prefer to use natural products to control the condition. High blood pressure has been linked with cardiovascular disease - the world's biggest killer - a cause of strokes and heart attacks. 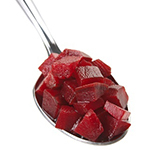 The beetroot juice supplied by Beet It, the UK's leading brand of beetroot juice, has a naturally high nitrate content. The research has clearly identified that this nitrate level is the reason it is so effective at lowering blood pressure. This nitrate (NO3) converts into nitrite (NO2) though interaction with enzymes in saliva which can be stored in body tissues where is can be reduced further to Nitric Oxide (NO) in the blood system. Nitric oxide is a signaling molecule that widens blood vessels, increasing blood flow and so reducing blood pressure. This also increases the blood supply and thereby oxygen supply to the muscles enabling them to work more efficiently. Beetroot juice has already been attracting a lot of attention from the sports world as Boris Johnson discovered to his surprise when congratulating David Weir, winner of the Paralympic marathon and 4 gold medal winner. In fact many medal winners from many nations were powered by "nothing more sinister than" little shots of concentrated beetroot juice. James White Drinks Ltd has been working closely with beetroot juice research teams throughout the world since 2008. It has recently expanded its beetroot pressing operations, helped by EEC funding. Located in Suffolk, the UK's only maker of Beetroot juice has worked with the scientific community developing its Beet It concentrated beetroot shots. It has recently launched two new beetroot juice blends (with Ginger and with Passionfruit) to widen the appeal of high beetroot content juice for those who find the original Beet It juice difficult to like! Lawrence Mallinson, owner of James White, which produces Beet It, said: "The William Harvey Research Institute has led the way in beetroot juice from the start. And as producers of Beet It, we are proud to be their beetroot juice supplier. We are now supplying around 40 universities world wide with Beet It." James White Drinks Ltd has footage of beetroot juice being pressed and bottled at Whites Fruit Farm, Ashbocking, Suffolk. It is available via the following link.